Richard Dawkins, the world-famous author of The God Delusion, has criticized GOP presidential candidate Mitt Romney and his Mormon faith, calling him a "massively gullible fool" for belonging to the Church of Jesus Christ of Latter-day Saints. "No matter how much you agree with Romney's economic policy, can you really vote for such a massively gullible fool? He is a Mormon Bishop!" Dawkins said during a series of Twitter messages on Sept. 9, as he attacked several past and present tenants of the LDS Church. The atheist professor's outburst was seemingly prompted by an interview he did for a Swedish television show alongside Brandon Flowers, the frontman of the band The Killers and a prominent Mormon, the Telegraph revealed. "Romney's prophet Joseph Smith is a fraud," Dawkins commented in his tweet on Mormonism, referring to the founder of Mormonism. Smith claimed he was visited by an angel in the 1820s and guided to a set of golden plates, which he translated and used to compile the Book of Mormon. "Bible & Koran genuinely old, written in the language of their time. Book of Mormon written by 19th (century) charlatan. Romney too stupid to see it," Dawkins' tweets continued. The professor then links to an article titled The Mormon Delusion, a play on his own work challenging Christianity and the belief of God, where in Jamie Smith, an atheist writer and blogger, criticizes many aspects of Mormon history, and says of Joseph Smith: "A fraud. A con artist. A brilliant story teller, but ultimately, a liar and an awful historian." Smith adds: "His cult should not be taken seriously, should have no power over the world." Focusing on some of the controversial aspects of Mormonism, Dawkins reminded his Twitter followers of a passage in the Book of Mormon that refers to the white race as "the chosen seed" and warns against taking part in interracial relationships. The Mormon Church, however, disavowed that teaching in the 1970s, and Romney has dismissed any notions that he agrees with the idea that interracial relationships are a sin. The evolutionary biologist also tweeted: "Could you really vote for a man who thinks the Garden of Eden was in Missouri?" referring to texts in the Book of Mormon that claim that Adam and Eve were sent to the site of present-day Missouri after being banished from the Garden of Eden for disobeying God. 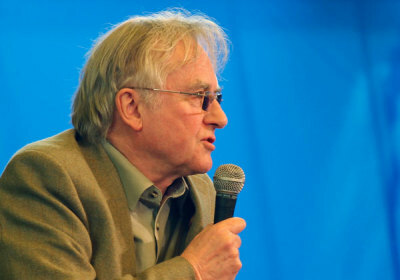 Despite President Barack Obama's repeated insistence that he is a Christian, Dawkins has also commented on the president by suggesting that, based on his intelligence, Barack Obama is an atheist. "I think Lincoln, Kennedy, Clinton, Obama may well be an atheist. Obama's a very intelligent man. He probably is an atheist," the professor said earlier this year. Mitt Romney's campaign has yet to respond to Dawkins' comments on Mormonism. The LDS Church reveals that as of 2011 there were approximately 6.1 million Mormons in the United States, comprising 2 percent of the population. According to a 2012 Pew Forum Poll, 46 percent of Mormons in America believe there is still a lot of discrimination against their faith, but 63 percent think that acceptance of Mormons is rising.